This is an update on our 2011 garden. We want to keep everyone up to date on what’s going on outside in the actual garden and inside under the grow light. This weekend provided some great weather (finally!) to really spend some quality time in the garden. We started the morning planting the remaining seeds into our last APS 24 growing system and placed them in the basement under the grow light. 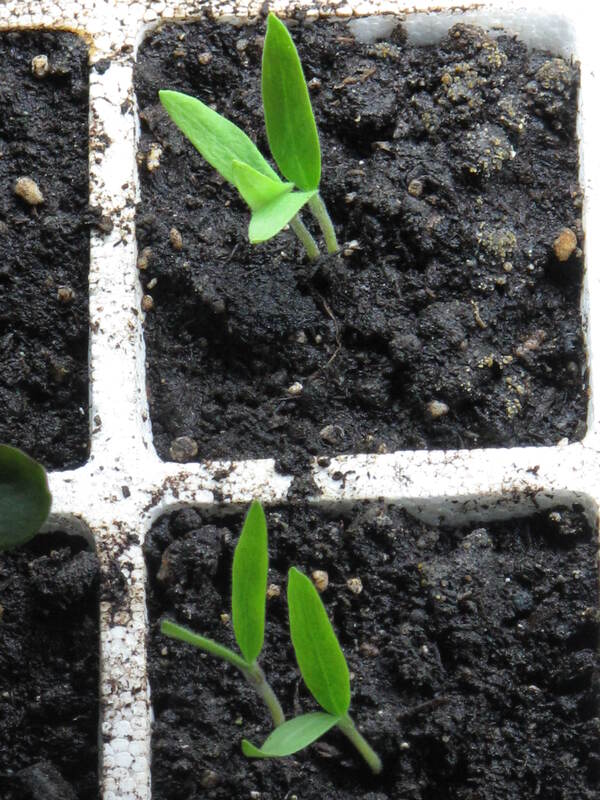 Our earlier planting was with seeds that prefer cooler soil temperature. This weekend, it was seeds that prefer warmer soil temperatures. Remember, our two batch planting philosophy? The seeds planted this weekend included three varieties of tomatoes and artichokes. Yes, artichokes!! We’ve heard that they can grow and prosper in Connecticut, so we thought this would be our fun garden experiment for 2011. Can Glen Road enjoy some stuffed artichokes at harvest time? Keep your fingers crossed. Inside the house, the first batch of seeds placed under the grow light are actually growing quite nicely. We’re happy to say that all of the seeds have sprouted and we have identified the strongest seedlings and removed the others in the cell. Only one plant per cell allowed. The weaker sprouts were removed by clipping them off with a pair of scissors. While the cabbage, brussels sprouts and cauliflower are over an inch high now, the eggplant is a little smaller and growing more slowly, so we decided to wait two more weeks before we remove their weaker seedlings. 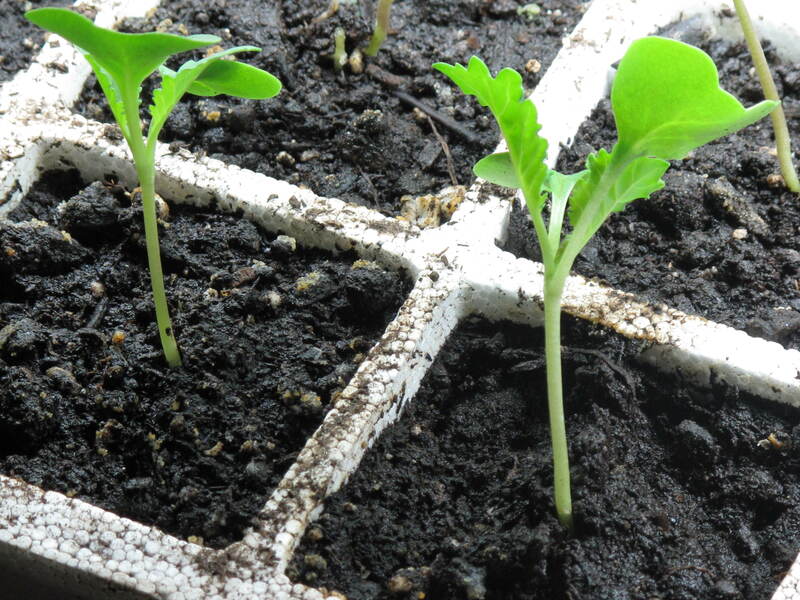 The picture above is a look at our cabbage and here are the smaller eggplant seedlings. Outside we were able to expand our seed planting to more than just spinach. Since the spinach seeds have been out in the garden since Thanksgiving 2010, we thought it was only fair to plant six more rows of seeds and grow some friends for the spinach. First, we turned under the crop cover of winter rye grass so that it would start to decompose and enrich the soil with its nutrients. Then we planted some seeds that thrive in early Spring’s cooler soil. This included one row of round radishes, two rows of French breakfast radishes, two rows of lettuce mix and one row of arugula. After the rows were planted, we stretched out a longer piece of floating row cover and placed it over all the rows of vegetables that are in the garden-the six rows planted today and the four rows of spinach that have been there since last year. We were wondering when the floating row covers could be removed for good and had gotten some mixed answers, so we decided to consult with an expert and last week asked when the covers could be permanently removed to none other than Martha Stewart on her live radio show. She told us that the row covers needed to be in place for quite a while longer as it is just too cold to remove them at this time. 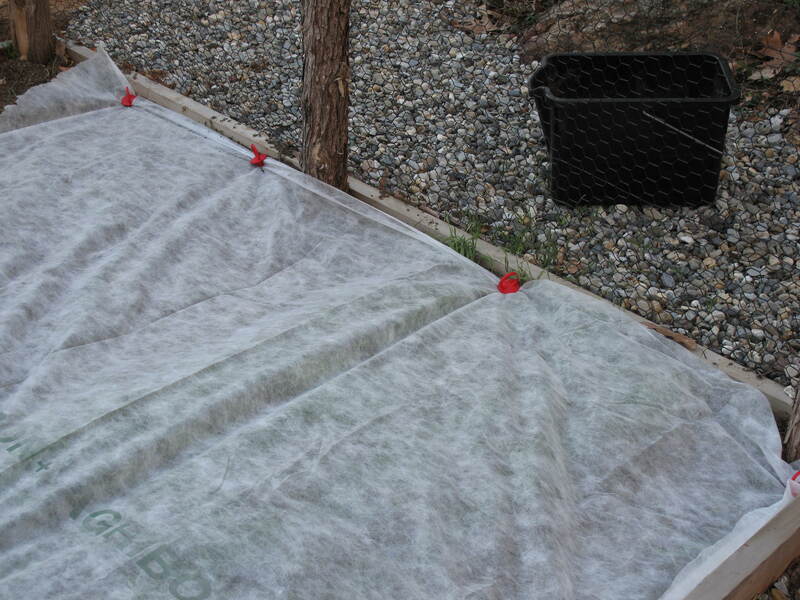 She said it was fine on warm days to pull the cover up and let the plants be in the direct sunlight, but that we needed to cover them back up before nightfall. We also started to talk about a few vegetables that we don’t grow because they spread out too much and take over the limited space we have in our raised beds. She said we should reconsider our stance on growing such things as cucumbers, zucchini and peas. So we started thinking and surfing the internet. What we found was an idea that we saw on several different gardening sites that we visited. We took a trip to our local farm supply store and bought a 16 foot livestock panel. 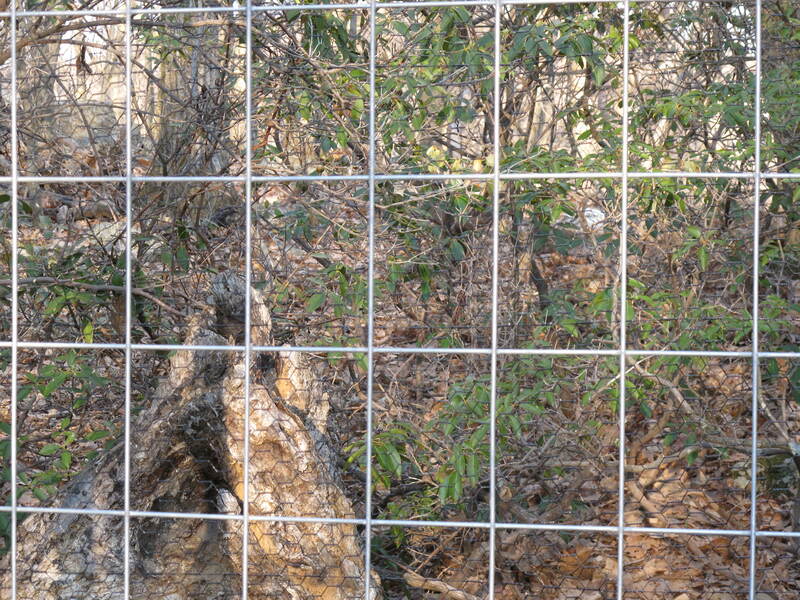 A livestock panel is actually used for temporary fencing on a farm. 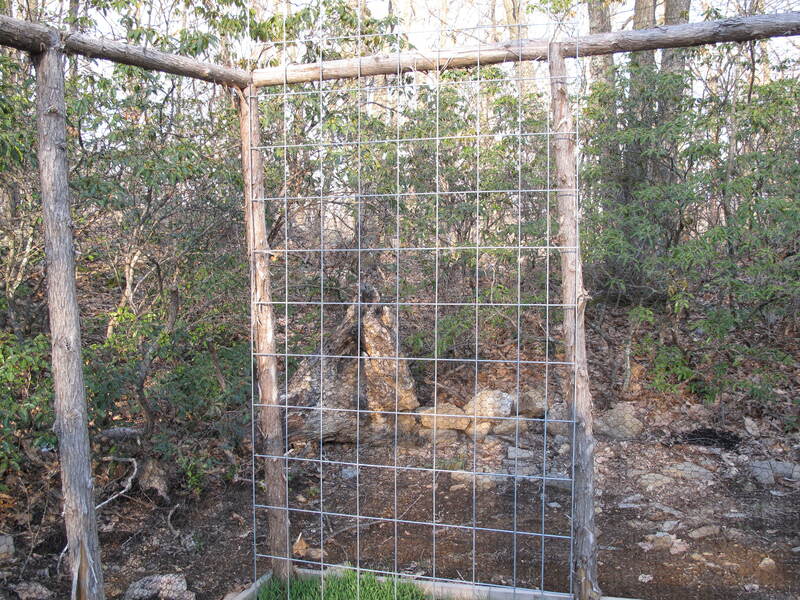 In our case, we used a bolt cutter to turn the one piece panel into two, 8 foot panels. Each panel was then taken into two of the raised beds and the cut ends were pushed into the soil and then the panels was gently leaned up against the garden fencing. Later in Spring, we will accumulate some dirt into mounds in each of the beds at the base of the fencing and plant cucumbers and zucchini. We will then train the vines to grow upwards and weave through the panels with the vegetables hanging down from the panels, making them easier to pick. Since the vines will grow upwards versus outwards on the ground, it means more room for other plantings in our small garden. We’ve asked whether the vegetables will drop off their vines due to their weight and upward growth and everyone has told us not to worry. We believe them, but we secretly have our doubts. 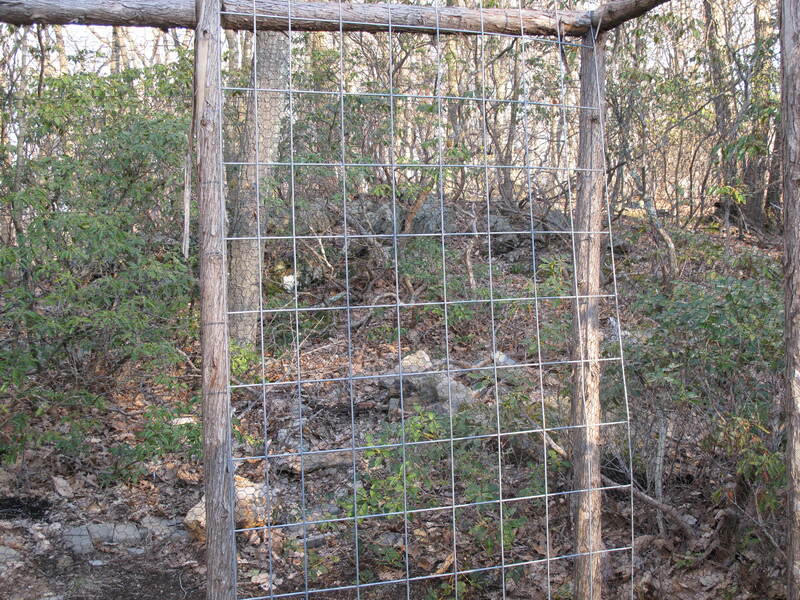 So for the beginning of April, we are feeling that our garden is on schedule and everything is growing as expected. From here on out, we know that the garden will consume a lot of our time, but the result is worth it. Nothing tastes better than home-grown vegetables. Are you working in your garden right now or is it still too cold? This entry was posted in The Garden-2011 and tagged Blog, Food, Gardening, Life, Nature, Photos. Bookmark the permalink.